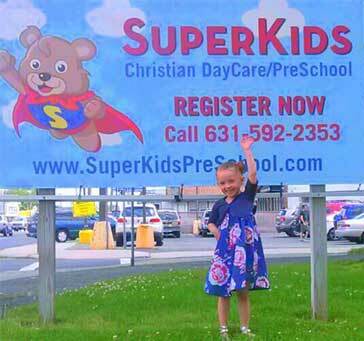 A Super Place for SuperKids! Surrounding your child with a good and healthy environment will influence them greatly and impact their future. Our staff is not only qualified by the NYS Children Care Program but have a caring heart towards the young generation of this day and understand their needs. Every child is precious to us and gets our full attention and dedication. We understand the first several years of a child's development can be the most critical to making them Super for the days ahead. 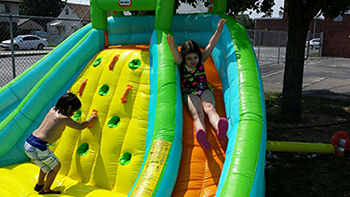 Our main objective is to have fun, improve social skills, and encourage creative expression. We will utilize a variety of activities to accomplish this goal. Free play, reading, arts and crafts, music/singing, dancing, dramatic play/pretend, puzzles, and educational videos are just some of the activities we will be doing. Music helps to develop young minds and will play a strong role in day-to-day activities. Children of all ages will be taught age appropriate curriculum daily. Indoor play: We have a full gymnasium for your child to run and play even when the weather outside is too cold, hot, or raining. Your child will be able to let loose and explore the different toys and games available to them which is vital for their social development and motor skills. We play games that promote throwing, catching, and kicking which will help them master ball skills and keep them healthy and in great shape. Your child will enjoy just good old fashion fun at Superkids! Outdoor play: We will be playing outdoors every day that weather permits. For the safety of the children we have approved school equipment. Please make sure that your child is appropriately dressed for outdoor play at all times. Our activities will include walks, playground, and organized games. Please contact our facility at 631-592-2353 and make an appointment with our staff. For your convenience you may print and fill out the registration form below.